During the Cold War the Western nations and the USSR developed weapons of mass destruction. Although many of these programs are “top secret”, some information is known about the synthesis of chemical agents by the USSR under the FOLIANT and NOVICHOK programs, both developed in response to the English and American development of agent VX. 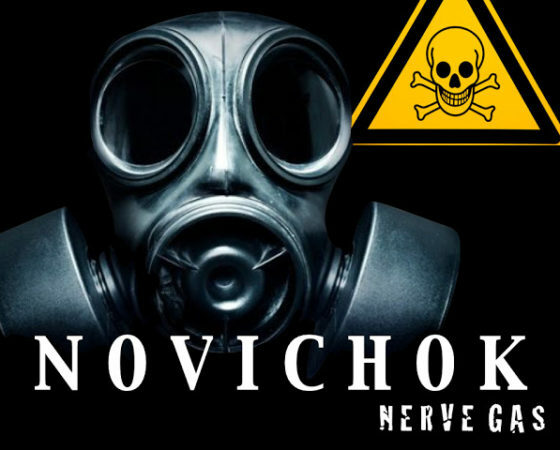 E. Nepovimova E. and K. Kuca gives us this information in an article in Food and Chemcal Toxicology, 121, (2018), 343-350 entitled “Chemical warfare agent NOVICHOK – minireview of available data”. The use of the first chemical weapons during the First World War having been an obvious success, the various belligerents, after the war, sought to improve their performance by inventing ever more powerful products. In 1934, the chemist Gerhard Schräder was commissioned to develop insecticides for IG Farben (Germany). He then synthesized 2,000 organophosphate products including ethyl dimethyl-phosphoramidocyanidate also known as tabun or GA, and then, in the process, propane-2-yl methylphosphonofluoridate or GB or sarin. These highly toxic products have been patented for applications declared secret by the German army. A little later, in 1944, it was 3,3-dimethylbutan-2-yl, methylphosphonofluoridate or soman or GD that was synthesized by Nobel Prize winners Richard Kuhn and Konrad Henkel. Until April 1945, 9,000 tonnes of tabun, 1,300 tonnes of sarin and 20 tonnes of soman were produced and stored by the German regime without having been used. Several reasons were put forward: Hitler’s negative personal experience of mustard during the First World War, fear of retaliation and underestimation of German superiority in this area. After the Second World War, the Russians and the Allied forces grabbed German production plants, technologies and experts in the field. In 1949, the British synthesized organophosphate esters including agent VX at Porton Down. They then negotiated an agreement with the United States to exchange VX technology for nuclear weapon technology and that is why in 1961 industrial-scale production of VX began in the United States. During this same period, an isomer of VX was synthesized in the Soviet Union and took the name of Russian VX or VR. This molecule has been used as the basis for a whole series of other toxic products: Novichoks. Until the 1950s, the use of “unitary” chemical weapons posed problems of production, storage, stability, hostility of local populations and environmental problems. No chemically stable weapons were developed for storage, which led the Americans to launch a program called “binary lethal weapons system” based on the use of 2 neurotoxic products: sarin and VX. Two or more non-toxic precursor compounds are physically separated. The final synthesis step is performed immediately or during the firing of the ammunition. This avoids toxicity problems during handling, transport and firing of the weapon. On the other hand, the construction of the ammunition is more complicated with smaller cartridges and lower yields in the final stage. The Soviets had little faith in this new weapon, which was more difficult and costly to make, especially since their stockpile was recent and they had not yet considered the destruction of defective and/or old weapons. It was the observation that the storage of Russian VX was very sensitive to moisture and its improvement in a thickened form and a binary compound that led the authorities to initiate the secret project “Foliant” in 1973 and 1976. It was intended to produce a 3rd generation VX much more toxic than its predecessors and not detectable by NATO standards. At least 3 products were then synthesized A230, A232 and A234. These molecules are unstable but the problem is solved by the development of stable precursors. Five types of binary agents have been developed with precursors not listed by the Chemical Weapons Convention. The first accurate information on A agents and Novichoks was published only after the end of the Foliant project (after 1992) by defectors like Mirzayanov in 2009. He was arrested, convicted of high treason and released a few months later under media pressure. He emigrated to the United States. Today, data on the synthesis, physico-chemical properties, toxicity and military characteristics of A-agents and novichoks are still kept secret. The following table provides an overview of the different known molecules. In March 2018, former Russian spy Sergey Skripal and his daughter Yuliya were found unconscious in Salisbury, United Kingdom. Later, the British authorities described the incident as poisoning by a nerve agent from the Novichok group, accusing Russia either of being responsible or of failing to control a possible leak of the product. Russia denies this, but since the investigation is still ongoing, it is not possible at this time to determine with certainty who is right and who is wrong. The following table represents the best-known physico-chemical properties of agents A, sarin and VX. A major disadvantage of the currently available neurotoxics is the imbalance between their persistence and volatility. On the one hand, there are G agents characterized by high volatility and low persistence. On the other hand, there are V-shaped agents that show high persistence, but reduced efficiency through direct action of the vapours. The third generation shows balanced physico-chemical properties of volatility, density and stability to light and moisture. The mode of action of A-agents is an irreversible inhibition of acetylcholine esterase (AChE) with a rapid aging process. The reactivators currently available (pralidoxime, obidoxime, HI-6) attack phosphorus with great difficulty, so that it is not possible to restore the function of AChE inhibited by A agents. On the other hand, the injection of BChE butyrylcholinesterase (“bioscavenger”) as a preventive measure that would bind and detoxify the neurotoxic would prevent it from reaching the AChE of the tissues and produce deleterious effects. Therefore, the only effective therapeutic approaches would be symptomatic treatment combining an anticholinergic agent and an anticonvulsant. According to unauthorized sources, A agents are neurotoxic agents that exert a higher toxicity or at least similar to that of VX. However, there are also several differences. In the unauthorized reports, it was mentioned that the symptoms of intoxication were practically incurable and that people exposed to such a type of nerve agent remained disabled. These reports describe a so-called delayed neurotoxicity characterized by a severe disruption of the nervous system manifested by paralysis occurring between 1 and 3 weeks after intoxication. The scientist Andrey Zheleznyakov was probably exposed to A 232. Five years after the intoxication, he died of cirrhosis, trigeminal neuritis and epilepsy. The approach must be both pharmacological and non-pharmacological, such as oxygenation, resuscitation and decontamination of the injured person and his environment. Immediate decontamination of the skin with products containing oximes can preserve the survival of victims by preventing the progression of the harmful effects associated with intoxication. Decontamination of surfaces (skin, clothing, equipment, etc.) limits the transfer of contamination to medical personnel and/or people present. Immediate or emergency decontamination can be achieved by dry decontamination with the DecPol glove. The DesDec product can decontaminate the environment. Pharmacologically, the treatment will consist of (1) administration of an anticholinergic agent such as atropine; (2) administration of anticonvulsants (usually diazepam or avizafon); and (3) use of reactivating agents represented by AChE reactivators (called oximes). However, as mentioned above, it seems that oximes would not be very effective, since the intermediary formed between the active site of AChE and agent A makes it more difficult for reactivators to initiate the nucleophilic attack. The possibility of “bioscavengers” must also be studied to treat intoxication by agent A: non-selective they can inactivate circulating agents A in the blood stream. Almost thirty years have passed since the first information on the mysterious compounds, called Novichoks, was revealed. Accurate and reliable data are still lacking and many of them are still based on hypotheses. In all cases, these products represent a serious threat and studies on synthesized products should be conducted to develop detection methods and antidotes. It would also be urgent to strengthen international regulations and controls by including A agents and their precursors in the list of the Organization for the Prohibition of Chemical Weapons. This entry was posted in blog-en and tagged Chemical agent, History. Bookmark the permalink.